When I returned from seeing this film my sister asked me "what is The Expendables 2 actually about? The trailer just has their names in it" - my response: "hmm, what is it about? Well The Expendables 2 is about an hour and forty minutes..."
The Expendables 2. Stallone. Statham. Li. Lundgren. Norris. Crews. Couture. Hemsworth. Van Damme. Willis. Schwarzenegger. (As the adverts show, this is the marketing department's idea of a plot). BANG. BOOM. Arnold Schwarzenegger Cameo. EXPLOSION. SHOOTING. Attempt at emotional moment. STABBING. MORE EXPLODING. Bruce Willis cameo. MORE BOOMS. MORE BANGS. Chuck Norris cameo. MORE SHOOTING. MORE STABBING... (Repeat for 103 minutes). To quote the film; Jason Statham: "What's the plan?" Sylvester Stallone: "Track 'em, find 'em, kill 'em." It's a shame that I didn't enjoy The Expendables 2 that much as I really wanted to after actually somewhat enjoying the original. Sure it wasn't perfect, and it was a pretty poor film on all technical levels, but it had its tongue placed firmly in its cheek which made it a perfectly fun one-off piece of fluff that ended up being slightly more than the exciting cast list that we all anticipated - an homage of sorts to the classic 80's action films and their macho-men stars, not unlike what The Cabin in the Woods does for the horror genre. It was fun and had a lot of laughs with its banterous dialogue, and with the collection of actors that it brought together it made for a special one-off treat. However by returning for a sequel, the one-off special quality has worn off, with a film that doesn't seem to be able to get it right again. The Expendables 2 feels lumbered for the majority of its running time; it takes itself too seriously, and when it doesn't it feels forced either by going too far over the top, or by just not being funny enough - thanks to the poor script and the feeling that it's trying too hard. Perhaps worst of all, the action isn't really as amazing as you'd want it to be either, and it's all because of that one threat that no Expendables style group will ever be able to defeat: the evil duo of characters and plot! I've already established that there really is not much of a plot. At all. The extent of it is that the bad guys are after some weapons grade plutonium (unfortunately not in order to power their modified DeLorean Back to the Future, or perhaps even back to their 80's glory days...), and that's about it. But everyone knows that going into the film, and if you're going to see this film you'll have accepted that fact before you've bought your ticket. You may argue that this is part of the point by staying true to a lot of the mindless action films that inspired it, but this time with no plot the film ends up falling apart, relying upon its characters and action to hold it together. The problem is we don't really care for the characters who are never really established or developed and become poorly written two-dimensional character stereotypes of their own acting persona's (the film even goes as far as to name Jean-Claude Van Damme's villain character 'Vilain' - that just says it all!). Alongside this the film tries to fit in too many of these characters for you to keep track of most of them, and as a result a lot of the characters just briefly appear and then disappear for large chunks of or all of the film, reappearing when the moment is right (a.k.a. when the rest of the cast are stuck in an impossible situation and the writers need the convenience of a quick exit). This prevents the film from actually feeling like a film; instead it feels like a cast of action stars having a reunion party (Stallone's character even says to cameoing Norris "well thanks for showing up" at one point, evoking a feeling of a film made by numbers), which in result hinders the impact of any laughs and the peril of any action scenes and the whole film just collapses into a big mess of misdirected moments that you just don't care about and can't get involved in. This all meant that for the majority of the film I just felt bored and uninterested, thinking about some of the other great films that the cast had made in the past. The first film was so bad that it was actually good; this sequel is so bad that it's just plain bad. A handful of cameos turn up to save the day... and the film! However to the film's credit it does manage to pick itself up for the final twenty minutes or so when the large finale action set-piece takes place. 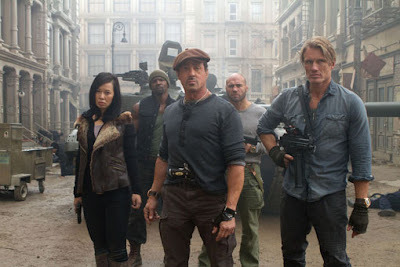 During the closing scenes of The Expendables 2 it all somehow seems to come together to form the exploitation throwback film that you wanted to see in the first place, just like the first one did. I obviously won't say what happens but the final events of the film provide some lasting moments which successfully balance the action and comedy just right, making up for the rest of the film in a small way by giving the overall film a big moment of redemption right at the end. It is worth seeing the last twenty minutes or so for this, and in fact you actually could just watch the last twenty minutes alone without the rest of the film and have a good time with full understanding (as if there is anything to understand! ); the problem occurs when you have to endure the rest of the film first. 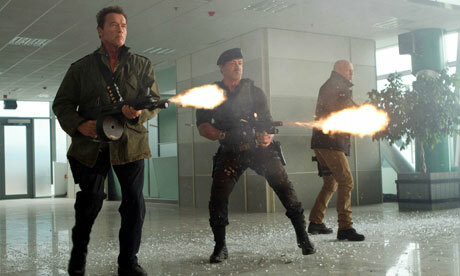 To the sequel's strength as well it does make a better use of its cameos this time around with Schwarzenegger and Willis actually getting involved in some of the action rather than just turning up to say hi like in the original, and Norris' moments providing some laughs too, with these three characters being a highlight in a rather dull film. It's just a shame that at the same time the film sacrifices Mickey Rourke's character who formed the heart and soul of the first film, but fails to return for the sequel. 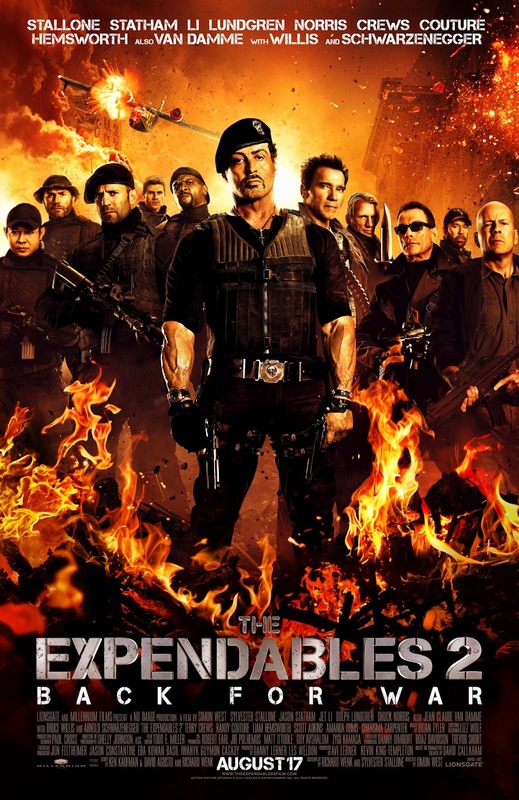 The Expendables 2 (certificate 15) is now showing in cinemas across the UK. Have you seen The Expendables 2? Agree or disagree with my review? Leave your thoughts and opinions in the comments section below! Good review Dave. The first one had its moments, but this one has plenty more of that and with plenty more iconic faces that I have missed seeing for so long. Hopefully this means that they’ll be back to stay for good. Hopefully, though.